Aside from the 2 editorials I styled for Preview Girl last December, I also styled an editorial for Meg Magazine that came out that same month. Meg Magazine’s EIC Bianca Gonzales was the one who asked me to do it, so who am I to say no? I gamely accepted of course! Tada! I’m on the contributor’s page! Anyway, back to the task. 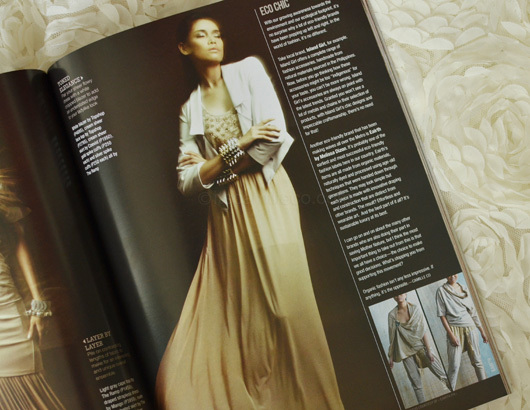 Bianca only had one requirement for the editorial–I had to stick to a palette of neutrals and earth tones. The rest were up to me. Meg Magazine gave me freehand in everything, from the concept down to the team. So how did it turn out? Take a look for yourself! 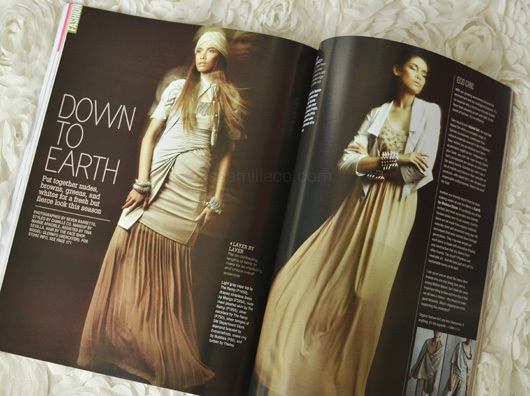 I’m so happy Meg Magazine recommended Seven Barretto as the photographer and Glennys as the model. Seven was so game and quickly understood what I had in mind, especially the blur effects that I wanted to achieve. (Achieve talaga!) Glennys was equally awesome too! She’s so easy to work with–effortless and most importantly, down to earth. This editorial is so different from the ones I styled for Preview Girl. Whenever I get asked to style, I always make it a point to ask what the target market is, specifically the age bracket. Meg is slowly shifting to a more mature readership as compared to before so I made sure to consider this transition. 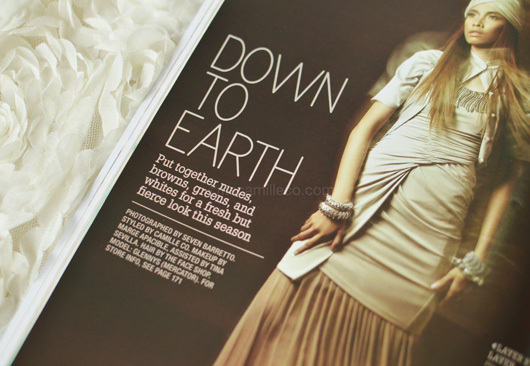 While I was doing pull-outs and pre-styling, I had no idea that the editorial had a message behind it, that the reason why I had to use neutrals and earth tones was because Meg wanted to associate it with environmental awareness. I also had no idea that I had to write the words for the spread! For the introduction, Bianca and Meg’s Grace Libero asked me if I could maybe say a few words about fashion labels that are eco-friendly and how the industry is doing its part in saving the environment. If you’ve got razor-sharp vision, you might be able to read my short article in the photo above. Because this editorial came out in December, I decided to do a little layering with options for both work and play. I combined different textures and silhouettes to achieve these looks. This last look on the far right of the page and the 1st look with the turban are my favorites. They’re perfect examples of how you can achieve a totally different look by just mixing the right pieces together. For the 1st look for example, that’s actually a pleated maxi skirt underneath a strapless draped dress with a soft buttondown blouse over it. See! You don’t need to buy an expensive gown to wear to a wedding or some formal party. Get creative and resourceful! Little details can make a huge difference. Look at the last look on this page. Without the little knot that I did on the cardigan, this look wouldn’t have quite the same effect now would it? So that’s it! I hope you like the little styling stint I did for Meg. Thank you Meg for trusting me completely with this. I feel so flattered! More power to you!